Our company is among the most sought after providing Domestic Express Service to the clients. This service is provided by the most experienced professionals who handled service efficiently with due care and attention. Domestic Express Service is secure, efficient and delivered in the allotted time frame. In addition to this, offered service is available at industry leading prices. 1. Will delivery all over Tamil Nadu major cities within 24 hours for all courier and cargo. 2. 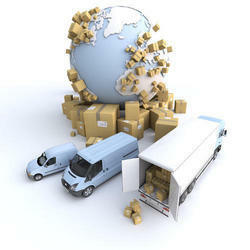 Will handle all International and Domestic courier and cargos. 3. Will provide discount for bulk invitation and other document booking. 4. Will provide best price for bulk cargo services. One of the value added services for contractual customers we offer is the To-Pay/Charges collect facility. The service allows the collection of freight from Consignee instead of shipper/Consignor. Emergency Expert - Emergency expert of tablets and medicines Also we are transferring for delivery.. Your time sensitive Documents / Non-documents are delivered next day in all Metros/Major Cities & Towns on priority basis. Shree Tirupati Courier Service Pvt. Ltd. has a distribution footprint that covers all corners of India. Regardless of the size or the timeline you’re working with, we will find a service offering that suits your needs. - Domestic Express Services for delivering documents and small parcels. Daily regular passenger’s services from Chennai to Madurai, and Vice-versa with Parcel and Courier Services. 3) Staff transfers for Cognizant Technology Solution (PVT) Ltd., Thuraipakkam, Chennai for various destinations in and around Chennai. Domestic Express Services for delivering documents and small parcels. Domestic Cargo Services for delivering heavier consignments that require special arrangements such as bigger vehicles, dedicated manpower and material handling equipment. It ensures priority deliveries at optimal costs, in both air and surface modes. We dispatch all your deliveries within the same day so that it reaches its destination the next day itself.